The next king of the digital coin storm – EarthCoin (EAC) welcomes the author to play! If you have great expectations for the future, I suggest investing in digital currency. Otherwise, there is no way to achieve your wishes. Do not believe that you ask yourself, what other channels can change your destiny? What is the loss now? The stock market has children’s bottom, baby bottom, pregnancy bottom, falling 10 days and so on, and a weak rebound, after N years of solution! As for those entities, entrepreneurship will not even say anything, and the rest of the life. I think that the biggest investment opportunity in the future is still in the digital currency. It can be said that the digital currency has risen for one day. Just as the stock has risen for several years and the stock has two daily limit, it has to suspend the self-examination, and the digital currency can rise up overnight to make you doubt life. I conducted a comprehensive comparative analysis of the 46 digital coins of the BIT.CC trading platform, and considered that the earth coin is the best investment target! It is estimated that some people will object, saying that bitcoin and citron are the most stable. They have the support of funds, application scenarios and token functions. Can I say that we are not investing in digital coins in order to get several times the proceeds? How many times can Bitcoin be flipped now? If Bitcoin doubles, it is estimated that the Earth’s currency has turned dozens of times. A. The volume is moderate, which is convenient for the dealer to operate. B. Decentralized like Bitcoin. The founding team only maintains, does not participate in management, and thoroughly spends money to speculate. C, low value, about 3 percent, any storm, you can get several times the income. D, BIT.CC trading platform price is lower than the global average price, there is a compensatory demand. E, the currency is highly safe, running for 6 years, unlike some project coins, two years of money to run people. F, the confirmation time is super fast, the transfer speed is faster than the Bitcoin Ethereum, and the total amount is less than the Ripple coin. G. Last year, Ripple rose 360 ​​times, while the earth coin as the old coin is a small number of old coins that have not risen. 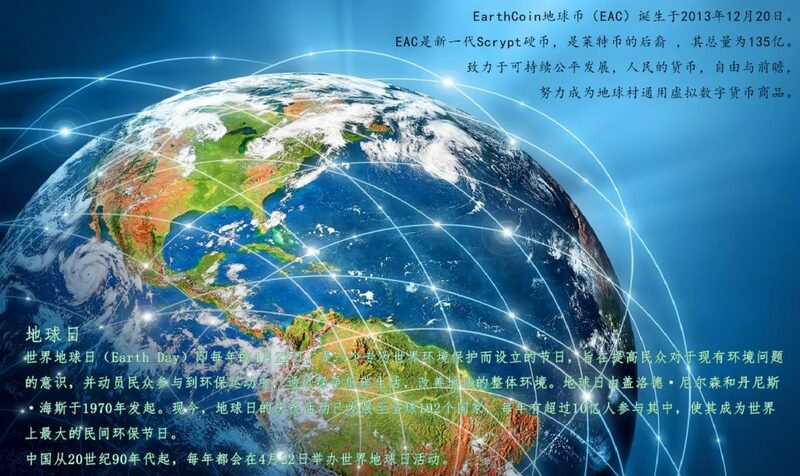 If we raise some earthcoin, it will become a Chinese-developed EAC team to help SK to upgrade the Earth currency technology for a long time. If we raise some earthcoin, it will become a Chinese-developed EAC team to help Sandokaaan(SK) to upgrade the Earth currency technology for a long time. The first four years of the Earthcoin only rose to four points. The fifth year of this year, the madness has only just begun. Are you ready? It’s the same with doing things. How many people haven’t seen the three centimeters! A pair of lovers fell into the sea and the sharks appeared. The girlfriend asked with tears: Where can I make so much money? The captain said: EAC EarthCoin understands. 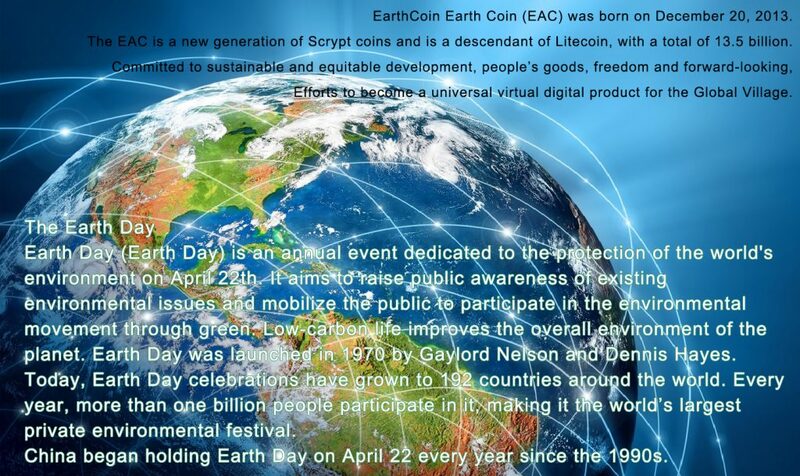 EarthCoin Earth Coin (EAC) was born on December 20, 2013. The EAC is a new generation of Scrypt coins and is a descendant of Litecoin, with a total of 13.5 billion. Efforts to become a universal virtual digital product for the Global Village. Earth Day (Earth Day) is an annual event dedicated to the protection of the world’s environment on April 22th. It aims to raise public awareness of existing environmental issues and mobilize the public to participate in the environmental movement through green. Low-carbon life improves the overall environment of the planet. Earth Day was launched in 1970 by Gaylord Nelson and Dennis Hayes. Today, Earth Day celebrations have grown to 192 countries around the world. Every year, more than one billion people participate in it, making it the world’s largest private environmental festival. China began holding Earth Day on April 22 every year since the 1990s. The second round of the CEO Exchange’s voting on the currency mechanism congratulated the ECOC in the 7-day voting contest for the third place. The CEO exchange negotiated with the official account of the Coin-Ocean Co., Ltd. on the Hong Kong time April 20, 2018. 18 : 18 minutes to open the ECo coins to transfer. It opened its trading market at 11:18 on April 22, 2018. Earth Coin (short for EAC) is a global cryptocurrency based on the Litecoin scrypt algorithm released on December 20, 2013 in Toronto, Canada. It is committed to sustainable and equitable development. The total amount of Earth coins is 13.5 billion, taking 365 days as a cycle, starting at 10,000 coins per block, with a sinusoidal curve of 2000 amplitude. In addition, EarthCoin is a screen-based coin whose community focuses on human, freedom and environmental sustainability. 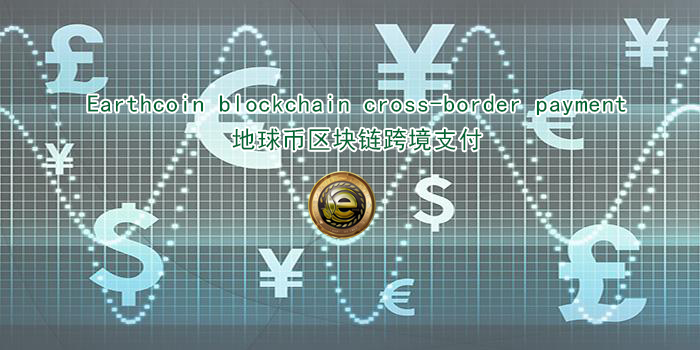 It has high-speed transaction speed, decentralization and design security. The purpose of its source is to become a pure trade based cryptocurrency for better profits. Risk Warning: There is a price fluctuation risk in digital currency. Please be sure to understand the products you want to invest before investing. Please invest rationally in your own range and be cautiously involved.